Wedding ceremonies are as much about enjoyment and exotic foods as they are about classy clothes. Around the world the Indian shaadi is famous because of it multifaceted looks in terms of décor and clothes. The bride holds the center stage and is expected to look like a diva. All eyes stay on her, as it is the most special day of her life. A typical Indian wedding does not limit itself to the wedding day only. There occurs a host little wedding ceremonies wherein the girl performs rituals and gathers blessings and good wishes of elders. This attire is so spellbinding that, even when the girl wears it on the little occasions leading to the wedding day, she looks extraordinarily different in each one of them. Actually, the credit goes to the variety of fabrics and a huge range of embellishments used for this traditional dress. These elements not only make the garment appear breathtaking in reality but also highly shimmering and gorgeous in wedding photos. Hence, for the bride the glamour of these sarees through these photos remain with her for the rest of her life. What is so special about YOSARI wedding sarees? We understand how much a girl wants to look class apart on her wedding day. For this reason, she starts shopping for her wedding months before it is scheduled. At YOSARI, we have a beautiful collection of these conventional dresses that are simply irresistible. You will also find here dresses with a twist like the lehenga saree, which looks exceptionally elegant on the bride. 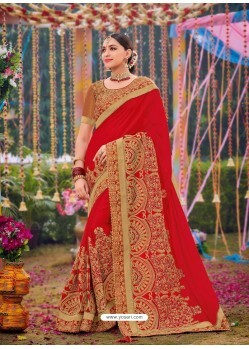 Our sarees are available in all colors and suit the traditional wedding attire requirements perfectly. 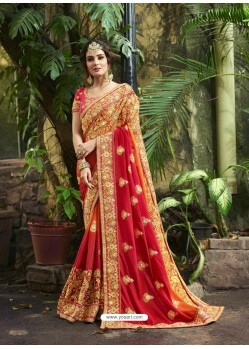 Moreover, keeping up with the latest fashion developments, our collection also includes modern wedding sarees. They have been designed by our special team of designers and feature modern color combinations, which will make you look chic and elegant on your wedding day. You wish your friends and other family members would look stunning too. Right? YOSARI’s collection of sarees truly takes care of this matter. There is a beautiful and fancy selection of dresses, which would make your friends, sisters, aunts and your mum look elegant. Surely, when they will pose with you for photos, you all will make a pretty and happy picture! The wedding dress is supposed to make the girl feel like a princess waiting for her prince. That is why only those fabrics that boast a touch of royalty are used for creating these sarees. Silk is an item of luxury that was worn by the king and his family members. Hence, sarees made of silk rank highest and in many cultures, the girl’s family gives them as presents to the groom’s family. Some of the most popular ones are made of Kanjivaram silk, Banarasi silk, Mysore silk, and so on. Other materials that are also used in creation of the wedding attire include satin, lace, brasso, georgette, velvet, chiffon, faux chiffon, and faux georgette. YOSARI is equipped with sarees made of fine quality fabrics. As every woman has a preference for fabrics, we have made available all the types. GO ahead and browse through the range, and select the one that would flatter your body type most. In a majority of Indian weddings, for the bride, red and orange hues are most preferred, as they signify fertility and prosperity for the wedded couple. YOSARI has a vivid range of this wedding attire in these colors. We take tremendous care in using the shades on the fabric so that the dress looks ultra-special. Moreover, the embellishments used on it have a classy appeal, which gives it immeasurable style and attractiveness. Traditionally, on sarees for wedding, you will find patchwork, zari work, hand and machine embroidery, sequins, zardosi work, applique work, kundan, brocade or lace border, net work, etc. In the most exotic collection, pearl, semi-precious stones, gold/silver thread work, mirror work can be seen. These elements become ever so striking when they are paired with lively prints, mesmerizing colors and spectacular motifs. Do you dream of yourself as a bride with all these embellishment? YOSARI holds a selection of sarees that will surely match the way you imagine yourself as a bride. Why online wedding shopping is the hottest trend? Online shopping is the best way to check out the latest wedding attire right from your living room. You need not visit every online shop for that because YOSARI brings the latest wedding dress collection under one website. What’s more, the dresses that you buy reach your doorstep in perfect packaging. Hence, you get the dress of your choice in pristine condition and save yourself the trouble of negotiating with shopkeepers. Our 14-day replacement policy is applicable on every dress that you purchase. We are confident of the quality of our items because we quality check each one them and then display them on our website. Still, under any circumstances, if you find the item to be dissatisfactory, you may return to us within 14 day of its purchase. We will not ask any questions and will return your money. We provide responsible shipping facility all over India as well as abroad. Our international locations include US, UK, Australia, and Canada. With so many benefits, now is the best time to get yourself signed in and start shopping!